– Help you to save money by comparing rates offered by different retailers to find best price. – Help you find ways to reduce the amount of energy you are using. – Let you compare your usage with other households in your area. – Let you compare the amount of energy you use at different times of the year. What’s on Your Electricity Bill? Account Details: Your electricity bill should clearly identify you, your premises, property meter number, and your electricity account number. To make it easy to get an electricity comparison, you can use your NMI and billing details listed here when you call Electricity Wizard. Getting in Touch: Here you will find contact information to call for customer service or help with your account. You will also find contact information to report a fault under the section titled “Faults and Emergencies”. Account Summary: This section will list the overall charge for the current billing cycle as well as the balance carried over from the previous billing cycle. A more detailed breakdown of costs will be listed in the New Supply Charges section. Your Account Summary will show how much is owing on your electricity bill and the date payment is due. If you are eligible for a Pay on Time bonus, it will also be listed here. If you have your account set up for automatic direct debit, the date that the payment is due to be processed will be listed in this section. If you have a plan with solar feed-in tariffs, your credits will also be shown in this section of your bill. Electricity Usage: This section will provide a summary of the number of kilowatt hours of electricity your household used within the supply period. If you are comparing bills, make sure the number of days within the supply period is the same. The Electricity Usage section of your bill will show what the previous read was, the current read, and the total amount of electricity used. If your household has more than one meter or tariff (for example, if you have a controlled load meter, or are on peak and off-peak rates) then each meter will be listed separately. This section of your electricity bill will also show you which plan or rate you are on. This makes it easy for you to check your electricity company’s website to see what rates and features your plan offers in comparison with other plans. The type of read will also be included. If you have a smart metre, then the reading will occur automatically. For standard meters, if the technician was unable to access your meter box you may have been given an ‘Estimated Read’. More information on types of reads is given below. Your next billing date may also appear in this section. It will give you an idea when the technician is next due to read your meter. This will be the approximate date of the end of your current billing cycle. New Supply Charges: This is the detailed summary of your new electricity supply charges for the billing period. This section will list the total kWh usage for each meter (as shown in the previous section) combined with the amount you pay per kWh. Your tariffs might vary depending on time of use. In this case, you will be shown the different costs for Peak, Off-Peak, and Shoulder charges. Each usage rate will be listed separately. 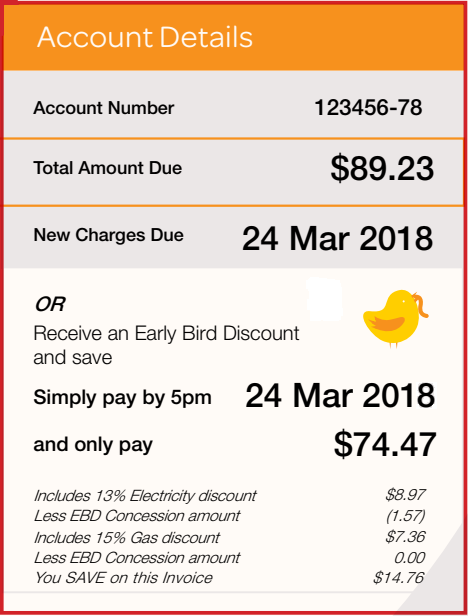 If the price your electricity company charges you for electricity changes within the supply period, they need to list each billing period separately. The Supply Charges section will also tell you how much your electricity company charges you each day to have electricity connected to your premises. This is the ‘supply charge’ and it is added to your usage rates. This section of your electricity bill will also give you a summary of your rebates or any discounts from concessions or bonuses. It will also list extra charges like the cost for receiving a paper bill or any late payment fees. Some electricity companies may show you the total price excluding GST and then add the GST in later. 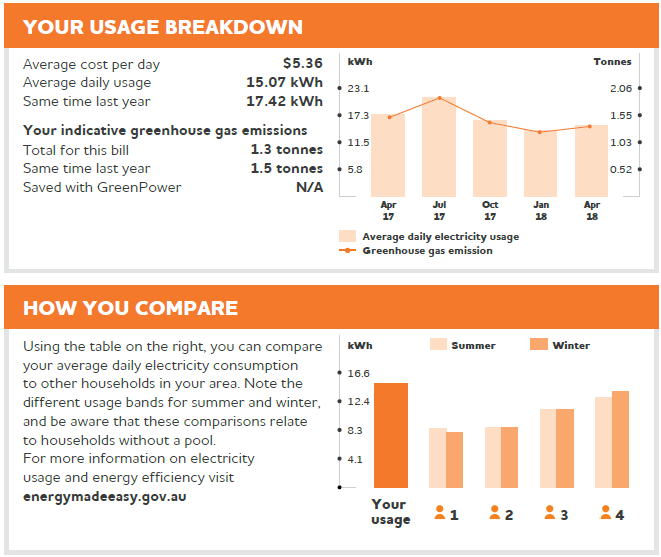 Comparison Graphs: Most electricity companies will include some easy-to-read graphs with your electricity bill to show you how your usage compares with other households. These graphs will let you know if you’re using more electricity than average for your area. If you find that you are consistently paying more than the average electricity bill, we have some handy tips and advice on reducing your electricity consumption. The included graphs will also generally show you how your energy usage changes throughout the year. Seasonal variation in energy use is usually a result of additional costs for heating and cooling. 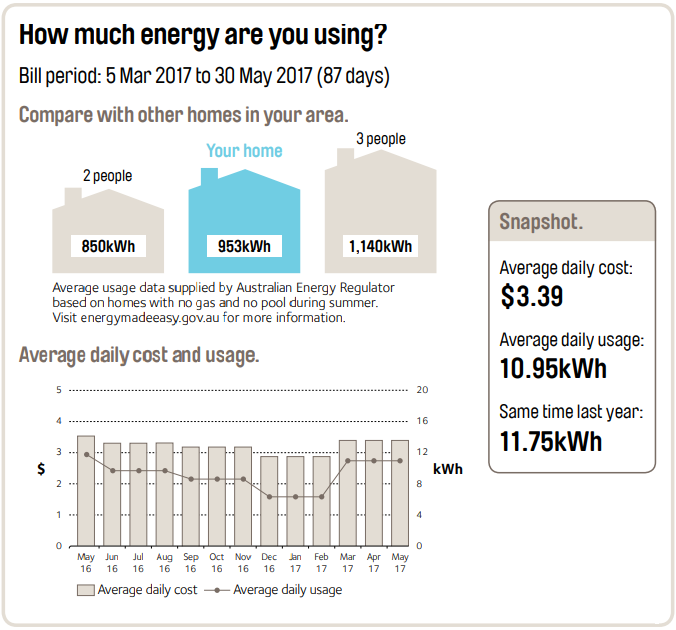 A comparison of your electricity usage for the same period last year can give you a good indication if your family has managed to be more energy efficient around the home. These summaries will also usually tell you how much you spend each day on electricity. If you are looking to save money on your energy bills, seeing a reduction over time in how much you spend each day can be extra motivation not to waste electricity by running the air conditioner longer than needed or to avoid running a load of clothes through the drier. An electricity cost calculator might give you ideas on where to save money. Electricity Supply Address: This information will include the name of the person or company who holds the account, as well as their supply address and mailing address, if different. NMI Code: National Meter Identifier code for electricity accounts. MIRN Number: Meter Installation Reference number for gas accounts. DPI Number: The Distribution Point Identifier number is the same as the MIRN number, although it goes by a different name. Supply Period: The timeframe covered by the current bill (also known as the ‘Billing Period’). Generally this is the time between meter reads. Unless you have a new connection or an individual billing plan, most supply periods are based on a three-month, quarterly period. Victorian households with smart meters will receive an electricity bill each month. 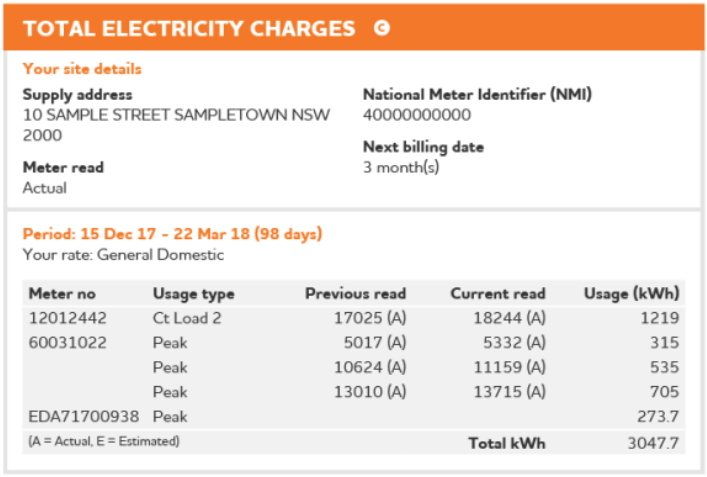 Type of Read: Most meter reads will be an ‘Actual’ read which will tell you exactly how much electricity your meter has recorded as being used over a given period. If for some reason the technician could not access your meter box, an ‘Estimated’ read will be used for that billing cycle. The usage rate will be an approximation based on average and past use. This estimate may be more or less than your actual use, however the amount owning will be adjusted on your next bill. Supply Charge: This is the fee you pay to be connected to the grid. The supply charge will normally stay around the same every bill (unless your supplier changes their pricing). This “service to property” fee is charged in cents per day. Usage Charge: This is what you are charged for the electricity you use. It is calculated by the amount of energy consumed multiplied by your electricity retailer‘s supply rate. It is charged in cents per kilowatt hour (you many see it abbreviated on your bill as c/kWh). Your electricity usage rate will vary according to the type of tariff you are on, but is generally made up of peak and off-peak usage charges. Single Rate Tariff: A single rate tariff means one set rate for your usage, no matter the time of day or night you’re using your electricity. These are generally higher than other tariffs and are less common with the introduction of smart meters. Time of Use Tariff: A time of use tariff means you’ll get charged different rates depending on the time of day you use you electricity. This usually means higher rates during peak times (the afternoon and evening), slightly lower rates during the shoulder period (early morning), and then lower rates during off-peak times (generally overnight). Controlled Load: A Controlled Load tariff applies to single appliances that generally have their own electricity meter. Things like electric hot water systems, underfloor heating, and your pool pump are likely to be on a controlled load tariff. If controlled load tariffs are available, they will often be significantly lower than other usage rates. Block Rate: Some companies will offer electricity in ‘blocks’ of a certain amount of kilowatt hours per day or per billing cycle. For example, you may be charge one rate for your first 1,000kWh each quarter, and a different rate for subsequent blocks. GreenPower Tariff: Many electricity retailers are beginning to offer Green Energy plans which allow consumers to choose carbon offsets or renewable energy generators. These plans typically allow users to choose to have between 10% to 100% of their supplied energy generated from renewable energy sources like wind, hydro, or solar. This means that customers pay a few cents extra per kWh depending on the amount of sustainable energy they want to use. Solar Feed-in Tariff: These rates apply to customers with solar panels who might receive a small credit on their bill for each kWh of electricity their solar system delivers back to the electricity grid. Rebates and Concessions: Different states offer various concession rates or government rebates for low income earners. If you think you are eligible for a discounted concession rate, Electricity Wizard can help you to find the best deal. If you’d like more information about how to compare electricity bills to see if you can save money, Electricity Wizard can help. Our guide to comparing electricity plans and retail companies will give you all the information you need to make an informed decision. Or, just call one of our friendly electricity experts for fast advice. We understand that you don’t have time to compare all the different discounts, so we’ve done the work for you. One fast, 5 minute phone call will let you know if you can switch and save. At Electricity Wizard, we do all the hard work for you. When you call us, we’ll compare your rates and plans against leading electricity suppliers available in your area and help you select the right plan. We’ll help you find the best company and plan to reduce your electricity bill with cheap rates and meet any other criteria you may have. Best of all, our service is completely free – so what do you have to lose? Try us today! Call Electricity Wizard now on 1300 359 779 or fill out your details below to have one of our comparison specialists help you get a better deal on your energy bills starting today!